The Bates College men’s cross country team placed the top two finishers and three of the top four in a dual meet with rival Bowdoin College on Saturday hosted by Bates at Pineland Farms. 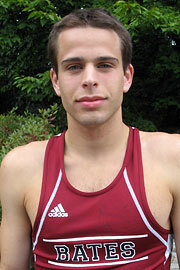 Bates senior captain Doug Brecher (Waban, Mass. ), took first place, finishing the 5-mile course in a time of 26:21, just a second ahead of fellow captain Devin Dilts (Roscoe, Ill.), a junior. Colman Hatton led the Polar Bears, finishing third in 26:37. Bates’ Sean Colligan (Goffstown, N.H.) and Bowdoin’s Stan Berkow rounded out the top five finishers. It was the second straight race win for Brecher, a former All-New England and All-State selection.